A pretty salad that packs in plenty of punchy flavours. 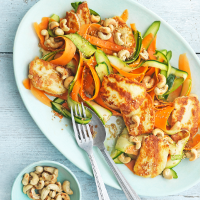 You can leave the vegetables to marinate for a couple of hours before serving, if you like, but fry the halloumi at the last minute as it’s best served warm. 1. Whisk the oils, vinegar, sugar, soy sauce and ginger together in a large bowl. Using a vegetable peeler or mandoline, peel ribbons of the courgette and carrot into the bowl; finely slice the cores. Toss in the dressing, then set aside to marinate while you prepare everything else. 2. Heat a large non-stick frying pan over a medium heat. Toast the cashew nuts for 3-4 minutes, until golden; set aside. Next toast the sesame seeds for 2-3 minutes, stirring often until golden; set aside with the nuts. Fry the halloumi for 1-2 minutes on each side until golden. 3. Lift the vegetables from the dressing and put on a platter or plates. Top with the halloumi and scatter over the nuts and seeds. Serve immediately while the cheese is still warm, spooning over a little extra dressing, if liked.